Comments are a notoriously mixed bag. On the one hand, comments might improve the overall quality of an article or blog post by adding valuable conversation and first-hand accounts from people all over the world. They also give blog owners the opportunity to get feedback from and engage with their readers. But comments can also be fraught with spam, inaccurate information, or even hate speech. As a WordPress blog owner, you'll need to decide whether you want to allow visitors to leave comments on your posts. Whether or not to allow comments might depend on the type of blog you write and the size of your audience. If your blog audience is larger, you're more likely to get many comments and thus more likely to get spam or negative comment content. Blogs with smaller audiences may not have this problem, but if you have heavier traffic you will probably need to spend more time moderating your comments. If you do allow comments, be prepared to moderate them regularly and for the possibility of comments that don't contribute anything to your blog, regardless of the size of your audience. The good news is that WordPress makes it very simple to customize your comment options. You can adjust your comment options right from the dashboard, and WordPress allows blog owners to disable comments for only specific posts or on every post on your blog. This will prevent visitors from browsing back through your blog and posting comments on older posts even if you still want to allow users to comment on future posts that you publish. If you want to disable comments on all future blog posts, log in to your WordPress account and select the Settings link on your Dashboard, then go to Discussion. Under the heading Default Article Settings, you will see a few options, including one which allows visitors to post comments on your blogs. 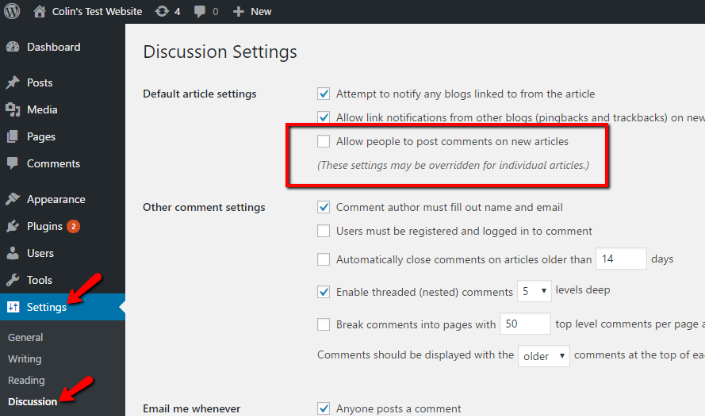 By default, this option will be selected, so simply de-select it to disable comments on any future blog post. This will entirely restrict users from posting any comments on any of your future posts, so once you uncheck the box you're done unless you want to set more advanced comment options. Keep in mind that unchecking this option will leave comments that have already been left on your posts intact, so if you want to remove them you'll navigate to the Comments link on your Dashboard. On this screen, you'll see all the comments that have been left on your blog. You'll choose each comment that you want to delete, then find the Bulk Actions dropdown menu. From there, choose “Move to Trash” and click on Apply to delete any comments that you've selected. Note that this action cannot be reversed, so take care if there are any comments that you do want to be left preserved. You can also moderate comments on individual blog posts. If you want to do this for multiple posts at once, click on the Posts section on your Dashboard and then click on the All Posts link. You can sort your posts by category, title, tag, or author to make finding specific posts easier. Simply select the posts whose comments you want to delete or restrict, then click the link that says Bulk Actions, click Edit, then click Apply. You should now see a Bulk Edit option, including a dropdown menu for comment options. Choose Do Not Allow and click Update to disable comments on any of the blog posts you selected. If you want to disable comments on posts individually, stay on the same screen, then click Edit Post. Underneath the area to enter the blog post, you'll see an area with the heading Discussion. Just de-select the “allow comments” option box to disable comments only on that post. This method is more tedious and time-consuming if you have multiple posts, but is a good way to quickly edit comment options for a few select posts. Finally, you may want to disallow visitors from commenting on media files as well. Even if you disable comments on an individual post, visitors can still comment on any media file that is attached to that post. If you want to prohibit visitors from commenting on media, go to your WordPress dashboard and click Media, then click Library. Choose the file that you want to prevent visitors from commenting on, and click Edit. You should find an editing box similar to the one used for text posts, and a checkbox for allowing comments. De-select the checkbox just as you did for a text post to disable comments on that media file. Unfortunately, WordPress doesn't offer the ability to bulk edit media files to disable comments, but there is specially-written code available that you can add to your theme to enable this ability. Moderator approval. Enabling this option will require moderator approval on any comment before it's posted publicly. You'll see pending comments in your Dashboard and can approve or reject them from there. If your blog has many readers and receives a high volume of comments, you can appoint other WordPress users as moderators to help the comment queue to a minimum so that you're not spending all of your time reading through comments. Blacklist IP addresses. If you know the IP addresses of spammers, you can block anyone using that IP address from commenting on your blog. This feature will also block IP addresses that partially match those on your blacklist. If you know some coding you might consider adjusting your code to block certain websites. User registration. You have the option of requiring any visitor to register a WordPress account before they post a comment on your blog. Of course, that won't guarantee that you won't receive negative comments, but requiring registration helps reduce the risk of spam, as many spam comments are left by bots that aren't able to register an account on the site. Approve certain commenters. Once a user has proven to be a valuable contributor to your blog comments, you can set them to be automatically approved to post comments on future blogs. This means you won't have to moderate any of their future comments. Limit links in your comments. Spammers like to leave links, and disabling users from being able to leave hyperlinks in the comments can cut down on the risk of spam comments. Restrict comments on older posts. Spammers are known for targeting older blog posts, so WordPress offers the ability to close comments on a post after a certain number of days. You can choose any number you choose and the number can be different for each individual post if you choose. Employing this option can reduce the risk of spam as well. Get notified about new comments. Quickly moderating your comments is your first line of defense against spam and hate speech. You can set WordPress to automatically notify you via email anytime you receive a new comment so you can quickly read and moderate it. If you have the WordPress app on your smartphone, you can also opt for a notification. Plugins. If you're a more advanced WordPress user, you might consider using one of the many plugins available to help cut down on spam comments. The Disable Comments plugin will quickly disable comments on your entire blog, or if you want a little more flexibility in controlling your comment options, you might try Akismet or WP Bruiser. Even if you do choose to disable comments on your blog, you can still engage with your readers through other platforms. Social media is a great place for users to interact, and using sites like Facebook or Twitter takes the responsibility of moderating spam or hate speech out of your hands. Internet message boards are also a great option, particularly if you want your users to be able to interact with and respond to each other on specific topics. Many websites offer free message board hosting. Integrating social media or message boards into your WordPress blog is relatively simple, particularly if you have some coding knowledge or are a more advanced WordPress user. Ultimately, there is no surefire way to avoid spam or hateful comments without entirely disabling the comment feature across every post on your blog. Many blog users choose to disable comments entirely, while others find that doing this robs blog readers of valuable conversation and interaction. The choice is yours as a blog owner. The good news is that WordPress makes it very easy to customize your commenting options and no decision is permanent; you can always go into your Dashboard and edit your settings as the need arises.